This chic two bedroom apartment in Barcelona, located in the seaside village of Barceloneta, is a top choice for those making a temporary move to the Catalan capital. With easy access to the beaches and historic downtown, the Mediterranean hotspot will be at your fingertips! 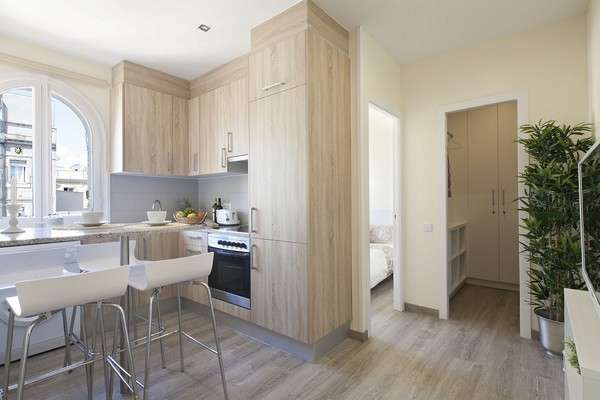 Able to accommodate up to four people, this long term rental apartment in Barcelona is a great choice for couples, families or groups of friends heading to the Catalan capital. Guests are sure to feel right at home in this modern, yet cozy seaside apartment. Kick back and enjoy a home-cooked meal, as prepared in the well equipped kitchen or get in touch with friends and loved ones back home, as an Internet connection is also available. Both bedrooms are furnished with a double bed and the apartment has one bathroom, fitted with a walk-in shower. Situated in one of Barcelona´s prime locations, this lovely apartment is a wonderful choice, any time of the year!